Credit: Pirelli & C. S.p.A.
Paul Hembery has become a very visible member of the paddock since Pirelli took over the sole tyre supply of F1. As the motorsport director for the Italian manufacturer, Paul spends a lot of time liaising with teams and the FIA to monitor the tyres, and tweak the compounds to meet the high standards of safety, durability and racing excitement required. Hembery started his tyre career working in research departments, and gradually moved up to a more commercial role. He joined Pirelli in 1992, becoming CEO of their Pacific company. As a more visible member of the team for the Italian tyre manufacturer, he dealt with the supply of rubber to the motorsport world, including the World Rally Championship, starting in 2008. The experience would come in useful when Pirelli rejoined Formula One as the sole tyre supplier. Paul has been the motorsport director, and spokesperson, for Pirelli since their return in 2011 - fending off criticism from drivers, teams and fans, whilst tweaking the tyres to try and spice up the action as well as retain the elements of safety and structure required for a good race. Hembery has also been an active Twitter user, engaging with fans and using social media as a soapbox to help air his thoughts on the state of the tyres within Formula One, and rebuking some of the criticisms aimed at the company. He also records audio thoughts after each Formula One race, and has engaged in Question and Answer sessions with fans throughout the season. Paul Hembery: "It's going to be tough in the cold weather, getting temperature into them. They're probably going to get 14-15 laps out of the intermediates... a lot of question marks though and that should lead to a good race." 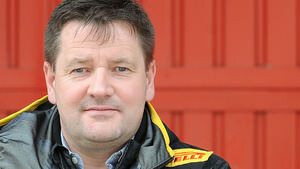 Paul Hembery, Pirelli motorsport boss: "Three, maybe two stops. It’s hot, I think I’ve been here 50 times over the years, and I’ve never seen this temperature. The teams have their free choice of the tyres, a lot of them brought the supersoft, no one was predicting this… I think the majority have a new set of the medium tyres and that’ll be central to the race." Paul Hembery, motorsport director at Pirelli, offered up some insight following qualifying yesterday: "The supersoft was used from start to finish, but the fresh asphalt meant that there was little grip on offer, and the track was evolving all the time. As a result it was an exciting session, which suggests also that there could be a high probability of a safety car tomorrow. "While a one-stop strategy is clearly the way forward, there are some good opportunities to have on this rapid circuit, which combines the unpredictability of a street circuit with the possibility to overtake and move up the field." The tyres on offer today are the soft (yellow) and supersoft (red). Pirelli boss Paul Hembery said on the grid: "Two stop, maybe Kimi’s got an extra option having that new set of supersofts. He’s very good here, maybe that will make the difference for him." Pirelli boss Paul Hembery is talking to the BBC about how they tweaked the wet tyres this year to be able to deal with more rain, and displace more standing water. I don't think they can cope with this though. Paul Hembery, Pirelli: "Looking at the cars going around on their regrouping lap, they’ve been trying out the full range. Some cars going off, there’s a lot of water. You’ve got a circuit with intermediate conditions for half of it, and full wets for the other. Drivers need to decide in the next twenty minutes… It’s going to be a race they’ll only use the softer tyre, that means people like Lewis have got as many sets as they need. They can really push very hard." 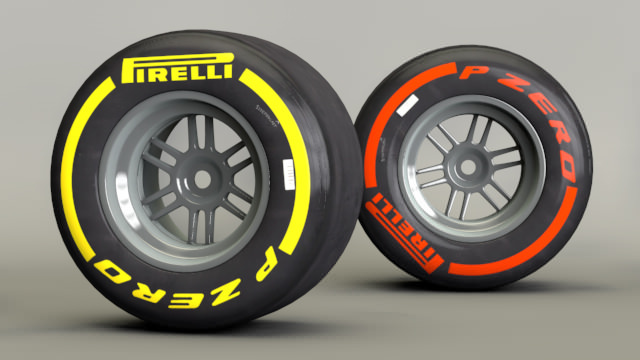 Soft and supersoft tyres are available for the drivers today, yellow and red sidewalls respectively. Motorsport boss Paul Hembery: "We are set for a very interesting battle tomorrow with eight different teams in the top 10. Two stops is expected to be the most likely strategy but just as was the case in Canada some teams might try a one-stopper, depending on factors such as safety cars."